From the internationally bestselling author of The Twentieth Wife, a novel based on the tumultuous history of a legendary 186-carat diamond and the men and women who possessed it. As empires rose and fell and mighty kings jostled for power, its glittering radiance never dimmed. It is the “Mountain of Light”—the Kohinoor diamond—and its facets reflect a sweeping story of love, adventure, conquest and betrayal. Its origins are the stuff of myth, but for centuries this spectacular gem changes hands from one ruler to another in India, Persia, and Afghanistan. In 1850, the ancient stone is sent halfway around the world where it will play a pivotal role in the intertwined destinies of a boy-king of India and a young queen of England—a queen who claims the Mountain of Light and India itself for her own burgeoning empire, the most brilliant jewels in her imperial crown. The Mountain of Light is a magnificent story of loss and recovery, sweeping change and enduring truth, wrapped around the glowing heart of one of the world’s most famous diamonds. 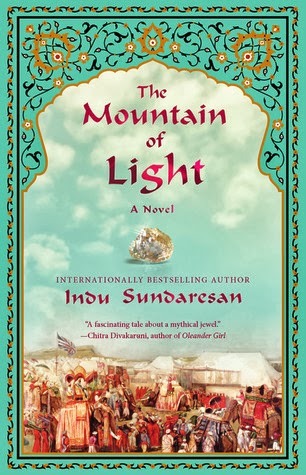 This lush novel by author Indu Sundaresan tracks the history of the history of the famous Kohinoor diamond from 1526 during the Mughal empire to Victorian England where it still resides today. Nicknamed the Mountain of Light, it was once the largest diamond in the world. The novel begins with the ousted emperor of Afghanistan, Shah Shuja, and his wife, Wafa Begam, who are being held as prisoners by the Punjab Maharajah, Ranjit Singh. If they give him the Kohinoor diamond, the Maharajah will aid the emperor in seizing back his throne. The story is a complex one, weaving the history of the diamond with the volatile country of India in the 19thcentury, its people, politics, and how it was so strongly entwined with the East India Company. The prose is rich and elegant, evoking sights and smells of the land and era while bringing to life many of the famous personages of the times. The author provided a brief history of the diamond at the start and helped clarify what was fact and what was fiction at the end. For those who love stories about the exotic, this tale is sure to please. Very highly recommended.